The CWE project (Common Weakness Enumeration) is an international community-developed formal list of common software weaknesses. CWE is a software assurance strategic initiative co-sponsored by the National Cyber Security Division of the U.S. Department of Homeland Security. The CWE effort aims to help shape and mature the code security assessment industry and to dramatically accelerate the use and utility of software assurance capabilities for organisations in reviewing the software systems they acquire or develop. - Serve as a standard measuring stick for software security tools targeting these weaknesses. According to research directed by the National Institute of Security Technology, 64% of software vulnerabilities stem from programming errors. To help identify core weaknesses contributing to software vulnerabilities, MITRE Corporation, a public interest not-for-profit organisation, created the CWE list. MITRE manages several federally funded research and development centres, including one for the Department of Homeland Security which is mandated with developing the CWE project. CWE was created to address the concerns of organisations that want assurance that the software products they acquire and develop are free from known types of programming errors. CWE unites the most valuable breadth and depth of content and structure to serve as a unified standard CWE's definitions and descriptions support the finding of these common types of software security flaws in code prior to fielding. This means both users and developers of software assurance tools and services now have a mechanism for describing each of the industry's software security flaw code assessment capabilities in terms of their coverage of the different CWEs. If necessary, CWE can also be scoped to specific languages, frameworks, platforms, and machine architectures. 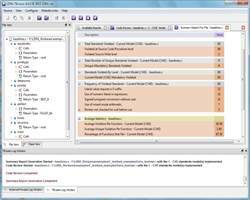 LDRA, the leading provider of automated software verification, source code analysis, and test tools, has achieved Common Weakness Enumeration (CWE) Compatibility for the LDRA tool suite. The CWE project aims to better understand flaws in software and to create automated tools that can be used to identify, fix and prevent those flaws. CWE Compatibility confirms that the LDRA tool suite can identify common programming errors contributing to software containing potentially exploitable vulnerabilities. CWE Compatibility recognises the ability of LDRA's static and dynamic analysis tools, LDRA Testbed and TBvision, to assist companies in finding security flaws and weaknesses in code, aiding the development of secure software applications. 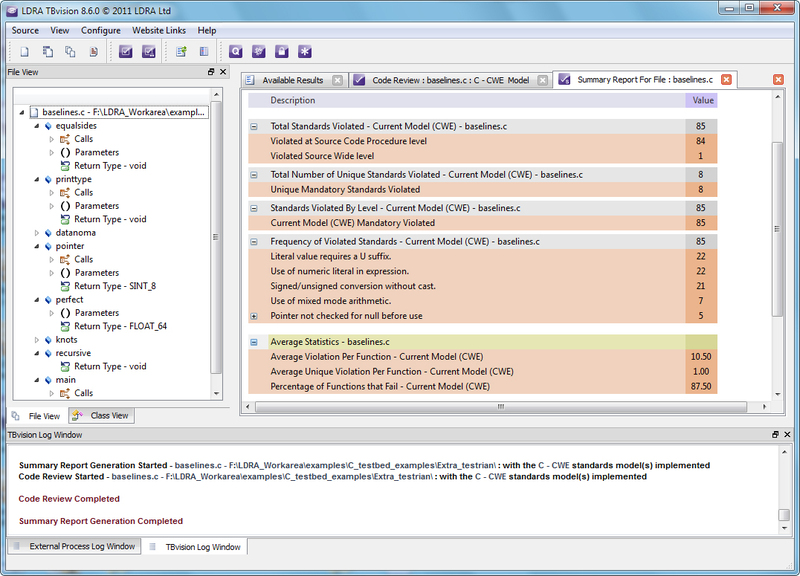 LDRA achieved CWE Compatibility by accurately mapping the LDRA tool suite to the coding rules of CWE so that the LDRA tool suite can identify reference and document weaknesses within the code. CWE establishes a list of software weaknesses that provides effective discussion, description, selection of the weaknesses as well as the use of software security tools and services that can find these weaknesses in source code and operational systems. CWE also seeks to better understand and manage software weaknesses at the architecture and design levels. 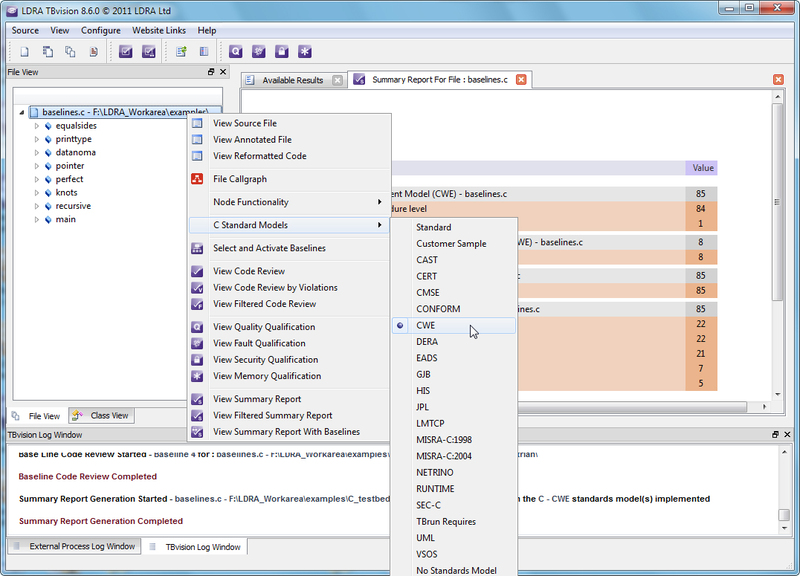 LDRA has integrated the coding competencies that contribute to secure programming into the LDRA tool suite.